University of Pittsburgh Press, 9780822963288, 72pp. Beth Bachmann’s previous poetry book, Temper, received the Donald Hall Prize in Poetry and the Kate Tufts Discovery Award. 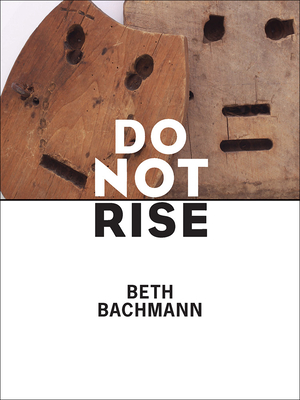 Do Not Rise received the Poetry Society of America’s Alice Fay Di Castagnola Award. Her poems have appeared in the American Poetry Review, Kenyon Review, Prairie Schooner, Boston Review, andSouthern Review and have been anthologized in TheBest New Poets 2005 and 2007. Her honors also include the American Poet Prize and fellowships from the Tennessee Arts Commission, Bread Loaf, and the Sewanee Writer’s Conference. Bachmann teaches creative writing at Vanderbilt University. "Nearly two centuries after the first recorded use of the term, 'war poet' still defies easy definition. It is a fraught laurel, one which Beth Bachmann wears with unflinching honesty and passion. Her latest collection,' Do Not Rise', demonstrates the lyric's ability to transcend its music and offer a haunting perspective on both violence and its aftermath . . . Indeed, it is difficult to imagine more vital poems than the ones Bachmann writes."